This Manhattan skyscraper is a reminder of the brief but glorious age of urban air taxis. High atop the 59-story MetLife Building in Midtown Manhattan, a disused landing pad recalls the period when New Yorkers commuted by helicopter. From 8:30 a.m. to 8:30 p.m., flocks of roaring choppers once alighted here, to the delight of their passengers and the equal fury of disturbed office workers. The controversial helicopter service ultimately met its end in bloodshed and tragedy. Unlock the secrets of the conjuring arts. The downtown helipad operated in two phases, from 1963 to 1965, and later in 1977, when the tower was known the world over as the Pan Am Building. 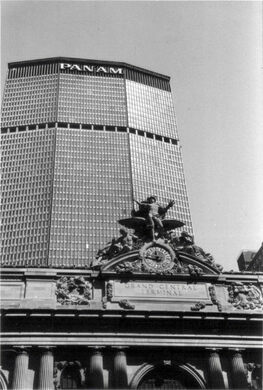 Pan American World Airways conceived of the helipad as a convenient connection between Grand Central Terminal (located right next door), and regional LaGuardia, John F. Kennedy, and Newark airports. Massive twin-rotor Boeing Vertol helicopters seated 20 and offered an unmatched airport shuttle service. Travelers could take the elevator to the top floor, grab a drink at the penthouse restaurant, and then whisk off to the airport in a flight that took fewer than 10 minutes. The helicopter rides were surprisingly affordable and were often complimentary when connecting with Pan Am departures. The rides were also a popular sightseeing activity. Still, all was not well with the flying taxi service. The constant helicopter traffic predictably ignited a fierce Not-In-My-Backyard reaction from locals who had to endure the thunderous racket. Scores of Op-Eds and an impassioned protest movement put an end to the Pan Am helipad after just two years. But it wasn’t a permanent end. A decade later, Pan Am gave the helipad a second shot using slightly quieter Sikorsky S-61 military helicopters. Once again, helicopters clattered off the Pan Am heliport to the consternation of midtown NIMBYs. The disturbance proved to be brief however, as tragedy struck just three months after its revival. At 5:35 p.m. on May 16th an inbound chopper from JFK Airport touched down on the Pan Am rooftop. As usual, the ramp went down and passengers began to exit the helicopter. The twin rotors were left spinning as another group waited for their turn to board for a return flight. Suddenly, the six-ton aircraft lurched to its side as the starboard landing gear crumpled and gave way. The spinning rotor blades smashed into the tarmac and exploded, sending a hailstorm of shrapnel flying into the crowd of ticket holders. Five people were killed and eight wounded in the most violent manner imaginable. Newspaper coverage of the incident was lurid and borderline voyeuristic when recounting the scene and describing the body parts scattered about. 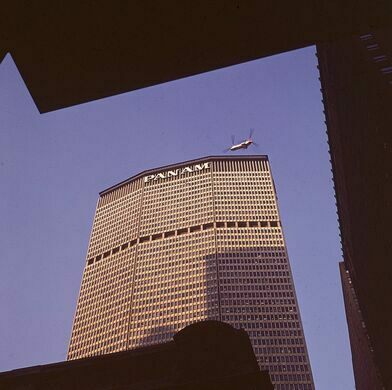 The May 16th disaster put the helicopter contracting company out of business and spelled the end for the Pan Am helipad. It also put a damper on the idea of urban rooftop landings, which today are only permitted at hospitals in extreme life or death cases. 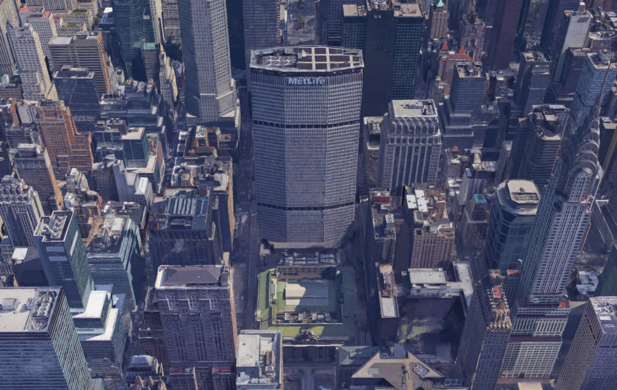 The helipad was closed and can no longer be accessed but the Met Life building still stands and can be visited. The famous facade of Grand Central Terminal hides a regulation tennis court, and it's not the first one. A sign marks the plane crash that caused two nuclear bombs to fall in North Carolina. A small, peaceful sculpture garden with a grim memorial to a disaster that took place a few blocks away.